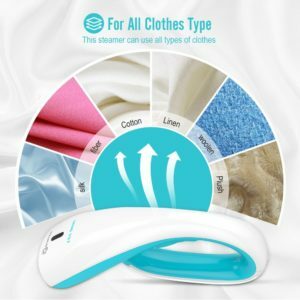 【SUITABLE FOR ALL TYPE OF CLOTHES】This clothes steamer can clean all the kinds of clothes you wear in your daily life. Materials it is suitable for include, organic fabric, silk, cotton, nylon blend, wool, linen, polyester blend and embroidery. Get one steamer and clean your entire wardrobe. 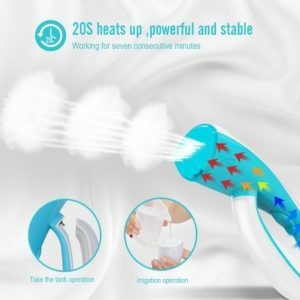 【FOR HOME USE AND TRAVELING – ANYTIME ANYWHERE】Traditional steaming of clothes requires a heavy, cumbersome ironing board that is inconvenient to handle and no one can take it traveling. 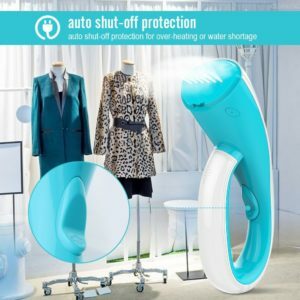 To solve this problem, we have developed this portable steamer to help our customers keep their clothes in the best condition anytime, anywhere. Say goodbye to the steam board from now on – lighter weight, more convenience, better results! 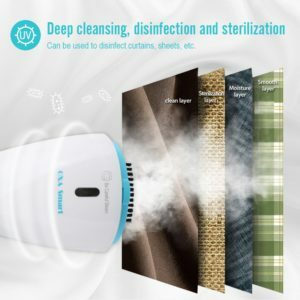 【DEEP STERILIZATION AND KILLS BACTERIA】When you steam your clothes with this steamer, it will effectively kill bacteria and viruses present on the material. 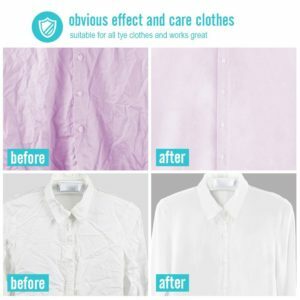 It’s not only great for clothes; it can also be used to steam clean your bed sheets, curtains and sofa. 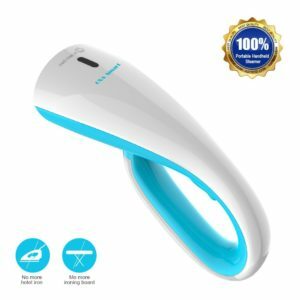 【POWERFUL & STABLE】It heats up in just 20 seconds. The 1000W power produces large amounts of steam quickly and runs continuously for 6-8 minutes. No need to wait for steam again! 【SAFE & CONVENIENT】Features a steam push-button that saves water and energy. Release steam only when you need it. It also prevents puddles and spills and means you needn’t worry about hurting your hands or the fabric. It also comes with auto shut-off protection to prevent over-heating or running out of water.